By the time you are reading this, the Mission 1:27 travelers will be somewhere between JFK and SVO (Sheremetyevo International Airport – Moscow)…thanks to the power of scheduled blog posts Yep, we are off to Russia – probably enjoying a fine Delta Airlines meal by now and trying to find a way to get some sleep! On this particular trip, we gathered at RDU for a noon time departure on Saturday. After a short flight to JFK, we were (are) on our way to Moscow. 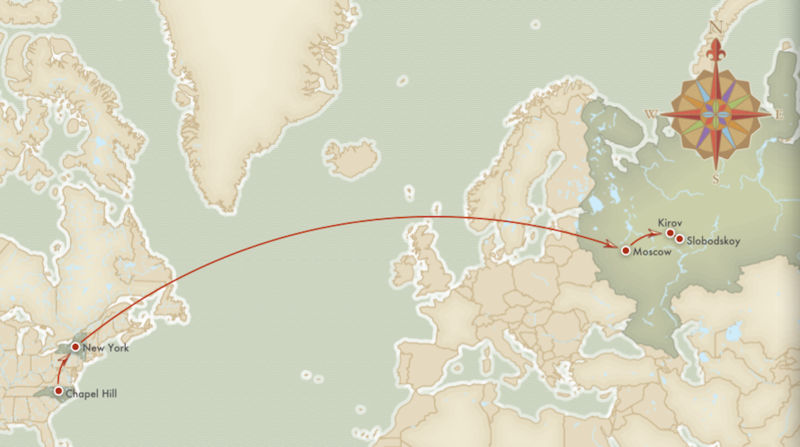 The flight left in the early evening in New York and we arrive at 10:55 a.m. on Sunday in Russia. Moscow is eight hours ahead of us, so it will feel like 2:55 a.m. EDT. But the energy and excitement will give us all the adrenaline we need! After clearing customs, we will spend the day in Moscow, getting our bearings and being tourists. Our sojourn will include a visit to Red Square, Saint Basil’s Cathedral and – something new for the return travelers – we will explore the Armory at the Kremlin. We won’t have long as our overnight train to Kirov leaves around 6:00 p.m. local time. From the Moscow train station, we will travel on the famed Trans-Siberian Railroad for the next 14 hours or so! Hopefully with a little sleep (but still no showers), we will arrive in Kirov very early on Monday morning. We will have breakfast at our favorite little cafe restaurant where we will be reunited with our dear friends – our interpreters. It’s one of our favorite parts of the trip – the reality of “returning home” really sets in as can only happen when you give a hug to a close friend you have not seen in many months. And it’s just the beginning of the hugs and love and happiness that we will experience over the coming days. After shopping for the last bit of supplies for the orphanage, we will then board a bus for the 40+ minute ride from Kirov to Slobodskoy (or Slobodskoi, depending on how you like to spell it). When we finally arrive at our hotel, it will be about noon Moscow time – or just about 40 hours after we leave RDU! It’s at that point that we will finally get to our hotel and be able to shower. After a quick shower and a little relaxation, we will get back on the bus for a 10 minute trip to the orphanage for the grand arrival complete with opening ceremonies, making of name tags and greeting old friends/making new ones.